** The ecumenical Mission of Holy and Divine Love at Maranatha Spring and Shrine. that you may learn wisdom and not transgress. 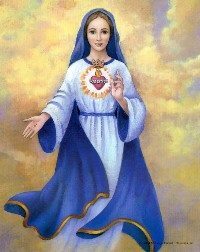 *** Per Message dated August 27, 2018, the Holy Mother (Blessed Virgin Mary) was sent by God the Father as ‘Protectress of the Faith’. Also note: In March 1988, the Roman Catholic Diocese of Cleveland through its “expert theologian”, summarily dismissed Our Lady’s request in 1987 for the title ‘Mary, Protectress of the Faith’ stating that ‘she already had too many titles’. So if there is any encouragement in Christ, any incentive of love, any participation in the Spirit, any affection and sympathy, complete my joy by being of the same mind, having the same love, being in full accord and of one mind. 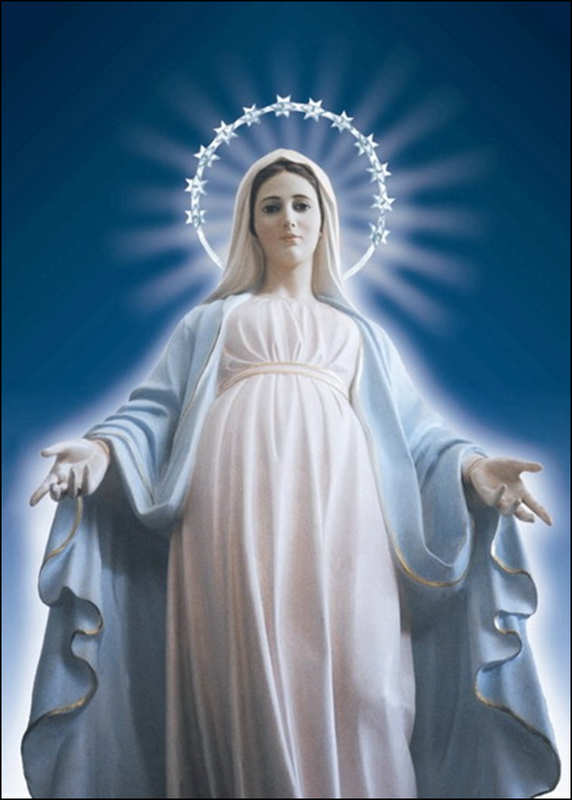 *** In March 1988, the Roman Catholic Diocese of Cleveland through its “expert theologian”, summarily dismissed Our Lady’s request in 1987 for the title ‘Mary, Protectress of the Faith’ stating that ‘she already had too many titles’. AS PRINCE OF THE HEAVENLY ARMIES, I COME TO EACH ONE OF YOU WITH LOVE IN MY SHIELD AND TRUTH IN MY SWORD. WHO IS LIKE GOD? WHO IS LIKE GOD? From north to south, from east to west, the Truth of the Divine Word will be heard without obstacles, therefore I am sent in anticipation to call you to full awareness as all God’s children. You have received the tools and more so that you receive the Supreme Truth. All your names are written in the great Book of Life, but not all will enter the Kingdom of Heaven. I come with the Word of Heaven, by Divine Will, so that you do not forget that there are instruments of God, each with a different commission, but united in the same call. It is not that only one receives in the name of all: the Trinitarian Will has its instruments throughout the Earth – they are not the same, as the fingers of the hand are not the same, but one is the call to conversion, to repentance, to recognizing the instant in which you are living and the proximity of the purification of all Humanity. I have to announce to you that the elements are acting with greater tenacity, and from above there comes calamity for the inhabitants of the Earth. I come with the sword in my hand, so that each one of you as children of the King communicate to your brothers and sisters that the time of the great calamity has arrived with force, that the infernal demon is roaring on earth, hurling his fury upon the children of Our Queen and Mother to intimidate them. AS A MESSENGER OF THE TRINITARIAN THRONE, I ASK YOU TO PRAY THE HOLY ROSARY WITH GREATER UNITY AND AWARENESS IN THIS MONTH OF OCTOBER DEDICATED TO THE HOLY ROSARY, which satan fears and by which he feels poisoned. I therefore request that in every family you pray the Holy Rosary at the same hour during the whole month, so that the Holy Rosary is prayed continually with great devotion and love, covering the 24 hours. I therefore have to announce to you a greater increase in Humanity’s purification, since the devil will burn with rage against the People of God. The sacrifice of our beloved King on the Cross was for all times and above all for this instant of trial and confusion, in which carrying a Cross with you as a sacramental does not mean that you are already exempt from sin or temptation. It is not the sacramental that will give you the salvation of the soul, Eternal Life, but the degree of awareness with which you act and work in accordance with the Trinitarian Will, which will lead you to recognize that Divine Love must be all in all. ON THE CROSS OUR KING CONQUERED SIN TO REDEEM ALL MEN, BUT EACH ONE OF YOU MUST MERIT THAT REDEMPTION, EACH ONE OF YOU MUST UNITE WITH OUR KING ON THE CROSS OF WHICH EVERY HUMAN CREATURE IS A PARTICIPANT. I see the children of God the Father waiting for signs or signals to repent, while the infernal devil is acting quickly through his various tentacles, and therefore he easily confuses you and causes you to fall into sin, into great apostasies, crimes, heresies with which a large part of humanity follows him, forgetting that the one who deliberately waits for the final instant to repent and make amends may be the one who does not obtain the instant to manage to make that repentance. Beloved(s) of God, whoever tells you to wait for signs or signals, whether in the vault of heaven, on Earth, or in the waters, in order to repent, that person is leading you to the precipice of hell into which you can fall. MY CELESTIAL LEGIONS GO PROCLAIMING “CONVERSION, CONVERSION, CONVERSION” THROUGHOUT THE EARTH. DO NOT WAIT TO CONVERT: CONVERT NOW! SO THAT YOUR CONSCIENCE BE ILLUMINATED BY THE DIVINE SPIRIT AND SO THAT YOU DO NOT CONTINUE TO SIN ANY LONGER, BUT LIVE BEING AWARE OF THE ABOMINATION OF SIN. Beloved(s), may constancy, effort, perseverance, prayer and the fulfillment of the Divine Law give you the fortitude to maintain yourselves in difficult instants; you must attain protection in your homes must be achieved through unity with our King and our Queen and Mother of Heaven. Awareness in receiving the Body and Blood of Christ, King of the Universe, gives you faith and spiritual strength so that you are light wherever you are. Each person’s protection is the spiritual relationship they maintain with the Most Holy Trinity and with our Queen and Mother; the sacramentals protect you to the extent to which each of you is in a state of Grace in the permanent struggle against evil . Oh beloved children of My Queen and Mother, do not expect miracles if you do not deserve them, do not expect protection for the body, but protection so that you do not lose your soul. The Earth is shaking with greater force, the waters are stirred up with greater force, the winds roar and gather extraordinary speeds, fire destroys villages, but the soul of the human creature that remains in faith – that soul is immovable. The struggle against the snares of the infernal dragon is increasing; churches are torn down, seized and desecrated, religious signs are eliminated from public and private places, the Cross is repudiated by the followers of evil. 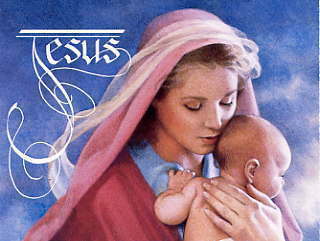 Beloved(s), continue to love with all your powers and senses the King of Kings and Lord of Lords who calls you to honor His Mother. Beloved(s), some human beings say that they do not see, do not feel God; they have forgotten that faith is exercised in surrender to what you do not yet see but know is true, and that His Will manifests itself over His People to lead them to Eternal Salvation. DO NOT FEAR IF YOU LIVE IN UNION WITH THE MOST HOLY TRINITY, IF YOU LOVE OUR QUEEN, DO NOT FEAR. FEAR OFFENDING GOD, FEAR SURRENDERING TO THE DEMON, FEAR ARROGANCE, TYRANNY, FEAR DISOBEDIENCE, COMFORT, PLEASURES, FEAR HYPOCRISY, FEAR NOT BEING OF GOD OR FOR GOD, FEAR SURRENDERING TO WORLDLY PLEASURES. FEAR TAKING THE DEVIL FOR GOD AND BEING CAST INTO THE FLAMES OF HELL. Love one another with the LOVE OF GOD, rejoice with the one who rejoices and grieve with the one who grieves. Disasters increase in the nations, tyranny in countries is stronger, anger makes man a slave of evil. I raise my sword as a sign of my faithfulness to God, One and Three, to my Queen and Mother and to all souls of goodwill and fulfillers of the Trinitarian Will. Do not fear: with my heavenly legions we stay above the People of God, the children of Our Queen are protected by the power I have received from God. 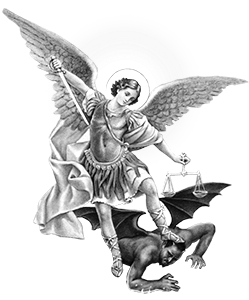 St Michael the Archangel, defend us in battle. Be our safeguard against the wickedness and snares of the evil one. May God rebuke him, we humbly pray, and Thou, Prince of the Heavenly Host, by the power of God cast into hell Satan and all evil spirits that prowl throughout the world looking for souls to devour. Amen. We continue our cycle of monthly messages for 2018 with the message from July 1, 2010 for our prayer groups and personal reflection. 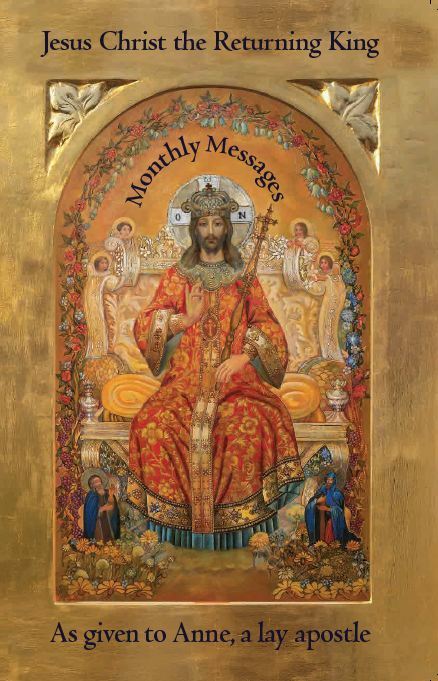 We continue our cycle of monthly messages for 2018 with the message from June 1, 2010 for our prayer groups and personal reflection. Dearest apostles, are you weary? Do you wonder why My service requires such holiness? I know that you do not always understand the relationship between your suffering and the graces I am sending to others. This is not clear to you when you are carrying heavy crosses that require great trust. When you are with Me for eternity, you will understand this connection and you will rejoice that you were willing to remain in My service despite the demands made upon your will. I ask and I ask and again I ask, and you answer, and you answer, and again, you answer. My dear apostles, you are in such a habit of saying yes to Me, that you continue on, day after day. The days are passing, are they not? One after another, days are completed and you have claimed grace for the world. 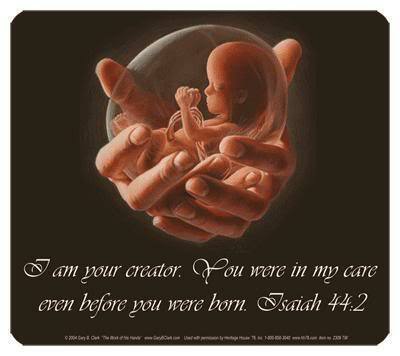 This is how it has been arranged for you, dearest children of the Father. You are asked to be good and holy and in return, the Father cooperates by keeping your intentions close to His heart. In this moment, where you have been placed, there is grace. Do you feel it? Do you trust Me? I am with you. I have not abandoned you. Will you resist the temptation to leave Me when I press on your commitment? If you ask Me for the grace of perseverance, I will give this to you. This is My gift. But you must ask for and then accept this gift. If you feel like you are failing and yet you are trying to serve as best you can, then you must spend time with Me and examine the concept of failure from heaven’s view. You may find that you are a success in My eyes, even while the world dismisses your contribution. All is well. Do not fear fatigue. Only fear a decision to abandon Me. Remember, I will never leave you. Never.